We wish all of you a very happy and healthy new year! Now that the big gift giving holidays are nearly over, some of you have boxes of new toys, games, and super hero jammies pushed back into corners while the favorite gifts (of the moment) are being fully explored. Others have just a few new things unwrapped under the tree or already being worn and played with. As we all settle back into the post holiday routine, we'd like to remind you that there is one gift that your child will cherish more than any other, no matter what his or her age. There is no greater present you can give a child than your undivided caring interest and attention. Whether you are playing peek-a-boo with a young infant, clapping with joy as your little one takes her first steps, listening with rapt attention to a 3-year-olds' never ending stories, or sharing the triumph of a first successful (if not haphazard) attempt at shoe tying, your loving acceptance and attention will spark memories that will outlast all of the latest gadgets. So, if there wasn't that much money left to spend on gifts this year, you need to know that it really doesn't matter. Baby science tells us that your presence and affection are the most important gifts your baby will receive. The special moments you share together directly influence how your baby develops, now and in the years to come. So, let the dishes soak and turn the cellphone off, remember how fleeting the stages of your child's life can be and take the time to enjoy each one. Our Most Popular Holiday Posts! With all the holidays, traveling, and New Year’s Eve celebrations this time of year, we thought we would share some of our most popular holiday posts with you. 1. First, a post from last year with tips to help you pick the right gift for your baby based on her personality. 2. 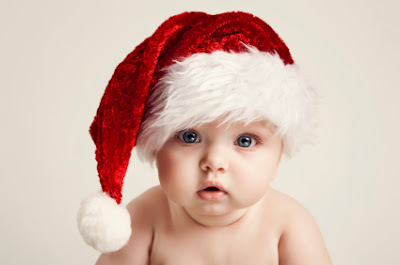 From 2009, a post on how to make the most out of the toys and gifts your baby will receive this season. 3. Finally, two posts that may help you avoid some of the melt-downs that can happen when you and your baby have too much to do or too many relatives and friends to see! We hope that these posts will help make the holidays a little easier for you and your little one. We're Halfway through our Terrible Twos! Just wanted to say thanks for the great blog. I had my fourth baby almost 6 weeks ago, and of course I feel like a first time mom because every baby is different. The blog posts I have been reading about newborn behavior have reassured me that my baby is normal an that I am doing all that I can for him. It's overwhelming to have another baby after having 3 already, and I am trying to be calm and relaxed, so thanks for the reassurance and tips. It made us so happy that we helped this mom and she helped us by reminding us why we do what we do! So, as we move closer to our 3rd birthday, we'd like to thank all of our longtime readers and welcome everyone who's new to our blog. We've covered many topics already, but we're always searching for new and useful information for our readers. If you have something you'd like us to write about or a question you need answered, please send us a comment or an email! In a past post, we shared information about maternity leave practices and laws around the world, including information about requirements and programs offered in the United States. After that blog posted we received several reader comments providing updated parental leave information for several countries. You can read the post and reader comments that followed here. Recently, there has been some buzz around a news report published by the US Census Bureau about first time mothers’ maternity leave and employment patterns in the United States. According to the US Census Bureau, more first time mothers than ever before are receiving paid maternity leave. While the maternity leave laws have not changed, there are more moms in the workforce and more mothers using paid leave benefits. New census numbers show 50.8% of new mothers received paid leave between 2006 and 2008. This is up from 43% in 1986-1990. Where did these numbers come from? The US Census Bureau surveyed 3.4 million first time working moms between 2006 and 2008. While these numbers are encouraging, the US remains only 1 of 3 countries that does not require paid maternity leave. The other 2 are Swaziland and Papua New Guinea. • While 2/3 of new moms with college degrees received paid leave, only 19% of mothers without a high school diploma received paid leave. • The mean age of mothers at the birth of their first child was 25 years; that’s up from 21.4 years in 1970. • Education level had increased among mothers with almost ¼ completing a Bachelor’s degree or more, compared to only 9% in 1970. • From 2006-2008, 66% of women worked while pregnant. About the same number worked in the 1980’s, but between 1961-1965, less than half (44%) of women worked during pregnancy. • Among mothers who worked while pregnant, about 88% worked into their last trimester and 65% worked until the last month of pregnancy. • Less than 10% returned to work by 3 months postpartum in 1961, whereas almost 45% returned to work by 3 months in 2005-2007. What have been your experiences with parental leave? How old was your baby when you first returned to work after your baby’s birth? We’d love to hear your stories and thoughts. For more about the family medical leave act (FMLA) in the United States, click here. To read the full census report about maternity leave and employment patterns of first- time moms, click here. Read a previous post about Preparing for Maternity Leave here. I'm a first time mom, and I need some help with my 9 week old and napping. She's exclusively breastfed and sleeps reasonably well at night (for a little baby - four hours max, very occasionally longer), but she will only nap in my arms, and she fights it every time. I've been trying to feed, then play with her until the first time she yawns, then I immediately try to get her to sleep. It generally results in 10-20 minutes of fussing while I bounce her, and she'll sleep just fine once she's down, but she's up the second we move, and I mean any movement at all. I have to make sure my phone is close to my left hand while I rock her, because if I reach for it, she's up! Is this normal for a kid this age, and is there anything I can do to get her to sleep in a bassinet? I'm reluctant to put her in her cradle in our bedroom just to nap, as I'm worried that will interfere with her sleep at night - bedtime is the only time we spend in that room. I'd just really like to be able to cook supper again, or maybe do a little picking up, as our house is getting to be more and more of a disaster! First, let’s talk about what’s normal with sleep patterns for this age. This reader is right, her 9-week-old sleeping a 4-hour max stretch of sleep at night is completely normal. Between 6-8 weeks, babies are just beginning to concentrate their sleep during the nighttime as they are more awake during the day. Also, as babies’ bodies mature, they will begin to follow the light-dark cycle , recognizing the difference between daytime and nighttime, but this doesn’t happen until around 3 months of age. As babies get older, they are more likely take naps at predictable times but not at 9 weeks of age. Having said that, let’s look at some findings from a large study of sleep duration specific to daytime sleep. • One-month-old babies’ daytime sleep duration varied from 2-9 total hours (all naps) per day, with an average of about 5 ½ total hours of daytime sleep per 24 hour period. • By 3 months, total daytime sleep averaged about 4 ½ hours per day, and ranged from 1-8 hours. This reader’s baby sleeps better in her mother’s arms and wakes with any movement. As we’ve mentioned in past posts, young infants fall asleep into light sleep. For babies who are sensitive to position change, moving them in this sleep state can wake them up. Waiting for signs of deep sleep (relaxed arms and legs, steady breathing, little or no movement, heavy body) before laying babies down may help them stay asleep. This reader also questioned if having her baby sleep in the bassinet in her room would interfere with nighttime sleep. Actually, the consistency of sleep environment for both naps and bedtime would be helpful. Also, having a similar bedtime routine for naps (though it can be shorter) as you have for nighttime helps babies know what to expect at naptime too. The key is consistency. Find a soothing routine that works and stick with it. Research shows that this can help babies fall asleep faster and stay asleep longer. For more about routines, click here. Knowing what your baby is developmentally capable of and following your young baby’s natural routine by watching for and responding to her cues will help your days go more smoothly. We know it’s hard to watch your house fall apart, chores go undone and personal time vanish, but we’ve all been there, and this will only last a short time! Ask for support during this time so that you can get a break. You don’t have to do it all yourself. Iglowstein I, Jenni OG, Molinari L, Largo RH. Sleep duration from infancy to adolescence: reference values and generational trends. Pediatrics. 2003;111(2):302-7. Last time, we shared some tips for parents to make dining out with their babies a little less stressful. We wanted to follow that up with a post on what you might do if you found yourself in a restaurant (as I did) near to a baby old enough to sit up at another table. 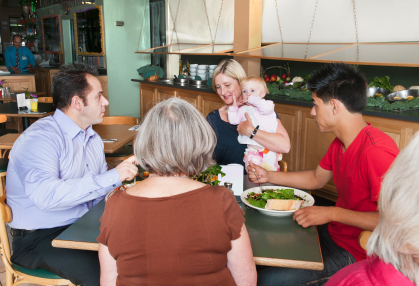 As a fellow diner, it is easy to make dining out with babies easier for parents. Not being rude is a great start. But, we know you want to do more than that.We know that our readers can astonish others by “reading” the universal signals used by babies. There is no better time to use that skill than when you find yourself in a restaurant with a baby. 1. Make it clear that you welcome the baby. Smile knowingly, stay relaxed and if you get an opportunity, say something nice about the baby. This may sound obvious but you may be the only one in the room who is welcoming. 2. If the baby is alert and looking around, try to catch the baby’s eye. The baby (as long as she is old enough) will be looking for a friendly face and once the baby sees you, the baby will take a good long look. You’ll see how hard the baby will work to figure out where you fit in the world. After all, the baby has no idea whether or not you are a relative or likely to be someone they will see again and again. If you maintain eye contact with the baby and the baby is old enough, you’ll see the baby “refer” to mom or dad to see if you are on the “approved faces” list. I hope you are. If not (sadly, some parents are very suspicious of everyone), just let it go and enjoy your meal. 3. Let the baby be the guide for any further interaction. 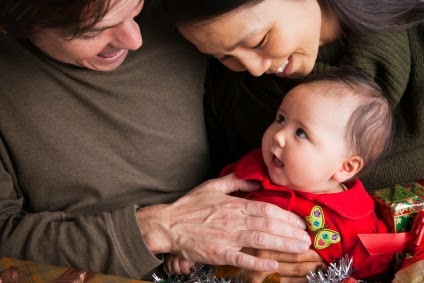 Babies love attention and if you are making eye contact while their parents are busy looking over the menu, the baby is likely to try to engage you in some way. 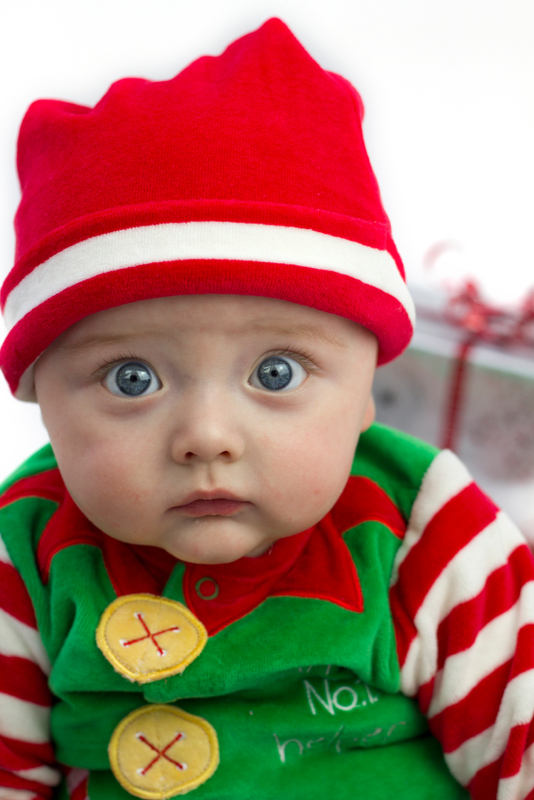 The baby may smile, open his eyes wider, or stare at you intently. Many babies will start a game of peek-a-boo by looking at you then burying their faces in their parents’ shoulders, then looking at you again. Here’s some fun “across the table/room” games to play. a. Peek-a-boo – there are many variations of this game but the gist is that the baby looks at you, then stops looking at you and then looks at you again. Thrilling, eh? Well, if not for you, definitely for babies. If you look away when she looks at you or hide behind your hands or your menu, the baby will at first watch you closely then start to play as soon as she figures out that she has a new playmate. The excitement for the baby comes from being able to predict that she will see your happy face again. b. Mirror games – babies love it when you repeat their actions. If baby shakes her head and then you shake your head, she’ll smile and do it again. The more you do it, the better the baby is able to predict what you’ll do, the more the baby will be amused and laugh. Clapping is another great activity for mirroring. Remember that the baby must always be the leader. c. Pointing games – babies love to point at things and have their parents talk to them about what they are pointing to. When you are a little farther away, you can make it clear that you are interested in what they are pointing to by looking in the direction in which they are pointing. If you are close enough and it is acceptable, you can talk to the baby about what you see. If not, you can change your facial expression enough that the baby knows you are paying attention. Looking surprised or pleased to see what the baby is showing you will keep the game going. There are two things to remember that will help your game playing be more fun for everyone. First, always let the baby lead the games and actions. When baby is in charge and predicting what will happen, the baby will be gloriously happy. Second, watch for disengagement cues. These cues will let you know if the baby is getting overstimulated. Playing with a stranger can be hard work! While I‘ve shared several ideas for playing, these games don’t have to make you miss your dinner. Most babies stay interested in strangers for only a few moments and by playing, you’ve given a clear message to the parents and others around you that you value the baby and the opportunity to interact. Bon Appetit! We're all off in different directions today! We'll be back next week with new posts. Have a great weekend! Recently, I was in a restaurant seated next to a large extended family that included a baby who was about 7 months old. The room was not crowded and the baby had a clear view of our table. Being a big fan of babies, I caught the baby's eye and for a few minutes, we played little follow-the-leader games across the room. As the family was leaving, mom and baby waved good-bye and the mom thanked me for entertaining the baby during the meal. Smiling, I thanked the mom for bringing the baby. By her surprised look, I could tell that it was not a typical experience for her. It made me sad to think that taking a baby to a restaurant has become such a stressful event. In this post, we'll share some ideas to help make this experience easier on you and your baby. Next time, we'll talk about what you can do to make things easier for another family if you find yourself in the position I was in, as a fellow diner near a family with a baby. When you have a choice about where you're going out for a meal, choose the place that will be the least stressful to you. The type of restaurant can make a big difference. 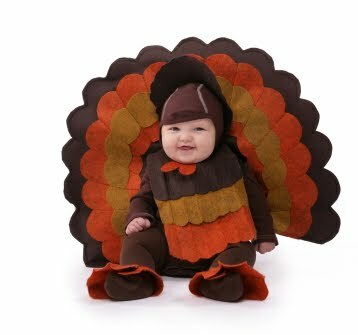 Consider your baby's capacity for stimulation. How busy will it be? What is the noise level? How many other children or babies are likely to be there? If you are new to taking your baby out, you might want to stick to casual places where there are likely to be other children. You might also consider finding out if there is a covered area outside where you (or someone else) can take your baby for a walk as needed. 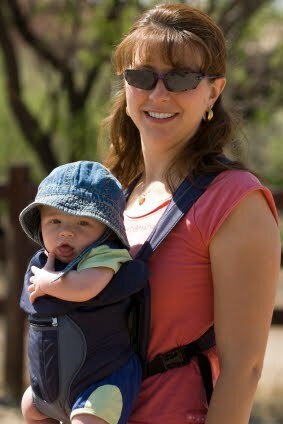 I'm sure that anytime you go out with your baby, you pack the diaper bag with everything that you might possibly need. Before going to a restaurant, you also should take the time to create a "game plan" with your partner or family members to deal with any challenges that may arise. Before you go, decide who will do what if something loud, embarrassing, or smelly happens! If your baby is less than 2 months old, there is no way of knowing when your baby will be awake, sleeping peacefully, or hungry. You'll need to be prepared for all 3. Older babies are more likely to be more predictable and it may be wise to time your outing to increase your chances of having a contented baby. 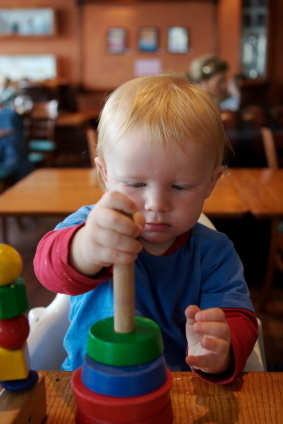 Your baby is very likely to be interested in all the sights and sounds that you encounter in the restaurant. Healthy babies want to explore their surroundings. But that means you need to be vigilant to make sure that anything potentially breakable, messy, or dangerous is moved out of your baby's reach. Relatives and friends will want to play and entertain your baby and that's great too. Take advantage of their willingness to entertain your baby to get something to eat! But, you'll also want to keep an eye on your baby to make sure that he doesn't become overwhelmed or overtired. It is common for friends and relatives to ignore the early disengagement cues until your baby becomes fussy. Trying to help, they might continue to stimulate the baby with keys, toys, or games. While these distractions may work in the short term, you'll start to see stronger and more frequent disengagement cues and your baby may become very upset. It is better to respond to the early disengagement cues with reduced stimulation (as simply as holding your baby closer to you and turned toward your body) and/or some repetitive sounds and movements until your baby seems ready to play again or falls asleep. The most important thing to remember when you go out in public with your baby is that you cannot control or predict what your baby will do anymore than you can control who else will be in the restaurant when you arrive. Your baby may suddenly have a fussy period or you may be greeted with exasperated looks from your fellow patrons before you even sit down. Your baby may have a huge diaper blow out just as your meal arrives. These things happen and are part of parenting. Someday, you'll look back on these experiences and laugh. Should anything unexpected happen, stick to the plan that you made before you left (i.e. whoever has eaten more leaves the table to change the diaper or settle your crying baby) and keep your sense of humor. While it is important to be considerate of your fellow diners, you shouldn't berate yourself about things that you can't control. 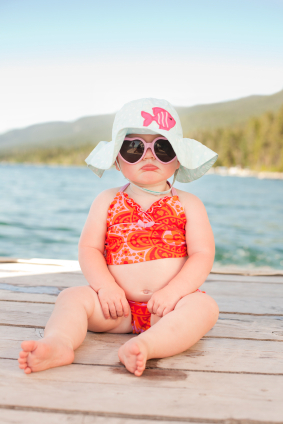 Being prepared, vigilant, and accepting will help your restaurant adventures be much more relaxing and fun for you and your baby. We're taking this week off to spend time with our families and friends. We'll be back with new posts on November 29th. Happy Thanksgiving! 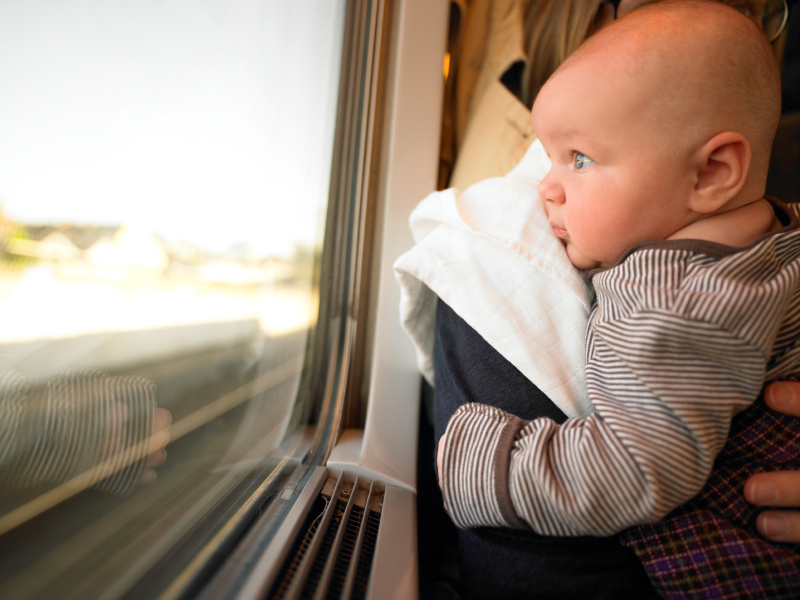 Given that we are entering the busy holiday travel season, we wanted to share some of our most popular posts about traveling with babies. For the basics, read "10 Tips for Traveling with Your Baby"
If you'll be traveling on your own with your baby, read "10 Tips for Traveling (on your own) with Your Baby"
Our readers know that we spend a lot of time traveling and sitting in airports. We know how negative people can be when they see families with babies boarding their planes. Just take a deep breath, use your skills to help your baby be as comfortable as possible, and let go of the rest. Maybe, if we're lucky, one of us will be sitting nearby and you can introduce us to your baby. In the meantime, we wish you pleasant and safe travels! In today's world, screens are everywhere. Entertainment and games, once restricted to television sets, are carried with us in our pockets, backpacks, and handbags. It is easy to turn to TV, games, and mobile devices when we want to be distracted or entertained. What about our babies? Is media exposure a good idea for babies? In a previous post, we talked about media targeted to babies and how the Disney Corporation pulled Baby Einstein videos off the shelves because the advertising claims that the videos would enhance development were not supported by research. Almost 2 years later, a new statement from the American Academy of Pediatrics (AAP) shows that media viewing by kids under 2 years of age, even educational media, not only has no benefits but can be harmful. 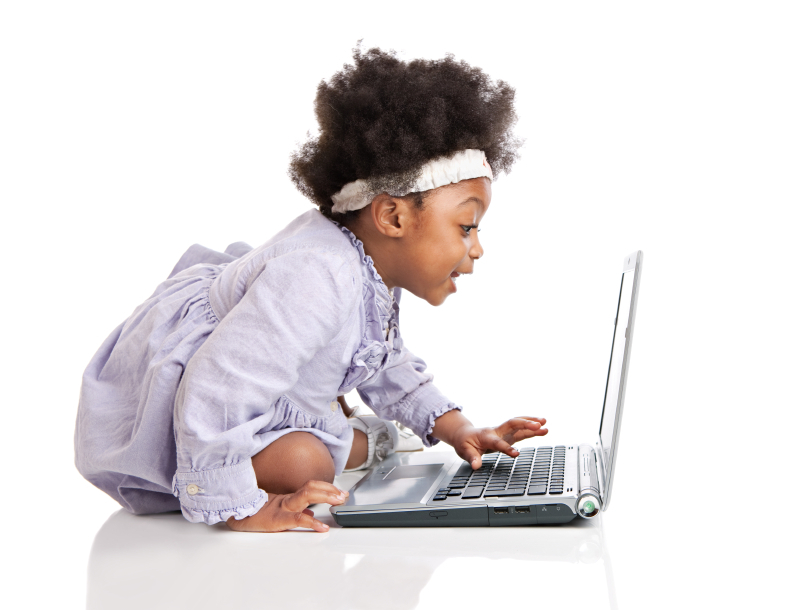 The new policy statement, released just last month, replaces the 1999 statement on media use in which the AAP first strongly discouraged screen time for children under age 2. However, recent data show most children under 2 watch 1-2 hours of media per day. While your little one may stare at the TV in wonder at the colorful characters and catchy songs, a key finding of this report is that usually only children over 2 have the understanding needed to gain any benefits from “educational” programs. New information also shows adverse effects of media use. TV viewing near bedtime can negatively affect your child’s sleep and heavy media use delays language development. The AAP also reported that parental media use in the same room where a child is playing has adverse effects on the child. While your child may not be watching your program, the TV distracts you from interacting with your child. The background noise also interferes with his own learning from whatever activity he is engaging in. Wow, with televisions, games, and media everywhere - what are parents supposed to do? In order to learn and grow, your child needs healthy interactions with three dimensional humans, not two dimensional TV or computer screens. Interacting with others, especially with you, allows your child to learn communication skills, develop healthy emotional connections and figure out how the world works. As parents, we use our facial expressions to communicate our own emotions to our babies. We also connect with our babies by reflecting their emotions of excitement, sadness, etc. as they show them to us. That’s how babies learn about the important connection between facial expressions and emotions. If we then talk to our babies about what they saw or felt, we help them connect feelings and words together. These vital connections must be learned from other human beings, not from watching people on TV. For more about how babies learn about their world by watching their caregivers, click here and here. It’s also essential to provide your child with unstructured playtime with limited distractions so that he can learn creativity, problem solving, and reasoning. Bonus: he will also learn how to entertain himself! If you are going to have TV on during the day for yourself or other children, try not to keep it on in the background all day. Set limits for viewing certain programs and then turn the TV off. If you need time to take care of a household chore child-free, set up a safe, independent activity for your child where you can see him that will engage him for a short time. You can still interact with your child and talk about how you’re measuring ingredients or engage him in talk about what toy he is playing with as you unload the dishwasher, for example. While limiting media in your home may be challenging, look for creative ways to make it happen. Most importantly, remember that your baby's brain is hardwired to learn best from his interactions with you in full color, 3D! There's no greater teacher for your baby than the real-world you! Need more ideas for entertaining your baby? Read a past post here. For a video of the AAP press release of the policy statement, Media Use by Children Younger than Two Years, click here. American Academy of Pediatrics Policy Statement: Media Use by Children Younger Than 2 Years. AAP Council on Communications and Media. Pediatrics 2011;128;1040. 1. How much larger do babies' brains grow between birth and adulthood? The weight of a newborn's brain is about 25% of its adult weight even though the baby's body is only 5% of its adult weight. By the time the child is 2 years old, the weight of his brain will have reached 75% of its adult weight. Wow! 2. Approximately, how many neurons (nerve cells) are babies born with? The answer is b) 100 billion neurons (nerve cells). Babies are born with more neurons than they can possibly use. As their brains develop, many neurons are "pruned" away because they are unused. This is a normal process which helps babies adapt best to their new world. The strongest neural connections remain as babies grow. 3. When do the areas of the brain that are most active in language development grow fastest? The answer is b) Between 6 months and 24 months. As we've mentioned in past posts, language development is happening before your baby says her first words. In fact, speech that babies hear when they are approaching their first birthday will help them learn to recognize the sounds characteristic of the local language that they will eventually speak. 4. True or False? The part of the brain that is used for planning and self-control is well developed by the time a baby is 12 months old. This is false. The very last part of the brain to develop is the part that is used for planning and self-control. It does not function during infancy and develops slowly throughout childhood and adolescence. Babies don't have the ability to control themselves by thinking or reasoning. That comes much later. This is a little bit of a trick question because the function of these neurons is controversial. Mirror neurons were first identified in monkeys. It was found that certain parts of monkeys' brains became active when they watched other monkeys reach for some fruit. The parts of the brain that became active in the observing monkeys were the same as those in the monkeys who were reaching for the fruit. Therefore, the observing monkeys had neurons that would "mirror" those in the active monkeys. The theory is that monkeys and babies form connections in the brain while watching others to help them learn and understand what others are doing. The presence of "mirror neurons" may be behind babies' abilities to learn so much so quickly. Not all scientists believe there are functional mirror neurons in babies. Just remember, no matter how his brain makes it happen, your baby will be watching and learning from you all the time. 1. Saffran JR et al. (2006) The infants' auditory world: Hearing, speech, and the beginnings of language. In: Handbook of Child Psychology: Volume 2. Cognition, Perception, and Language. Hokoken, NJ: Wiley. 2. de Haan M and Johnson MH. (2003) Mechanisms and theories of brain development. In: The Cognitive Neuroscience of Development, New York. Psychology Press. 3. Luciana M. (2003) The neural and functional development of the human prefrontal cortex. In: The Cognitive Neuroscience of Development, New York. Psychology Press. 4. Cattaneo L., Rizzolatti D. (2009) The Mirror Neuron System. Arch Neurol 66: 557-560. 5. Hickok G. (2009) Eight problems for the mirror neuron theory of action understanding in monkeys and humans. J Cogn Neurosci 21:1229-1243. We are living in exciting times for those interested in knowing more about how babies' brains work. Scientists are using the latest brain imaging technologies to help us understand the reasons why babies behave the way they do. In today's quiz, we're focusing on findings from brain-specific research. We invite you to share your guesses by posting a comment! Here are a few things you can do to work with (instead of against) your baby’s natural rhythms. 1. Keep the room where your baby sleeps dark at night. When your baby wakes during the night, keep the lights low when taking care of his needs, such as feeding or diaper changes. 2. Expose your baby to natural light during the day. 3. Follow a consistent bedtime routine that includes slowing things down in the evening, including lowering the lights and noise level. 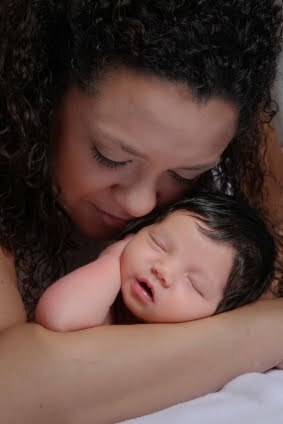 The first 6-weeks of your baby’s life are especially challenging; learning about your baby’s sleeping and waking patterns can help you understand why your young baby may seem like he doesn’t follow a consistent “schedule.” You are going to need help during those weeks when you are most sleep deprived yet need to take care of your other responsibilities. Your baby eventually will learn that nighttime is for sleeping. Until then, here are some past posts to help you deal with the inevitable sleep deprivation you will experience while your baby needs so much nighttime care. Can Little Changes Lead to a Little More Sleep? Peirano P, Algarín C, Uauy R. Sleep-wake states and their regulatory mechanisms throughout early human development. J Pediatr. 2003;143:S70-9. Mirmiran M, Maas YGH, Ariagno RL. Development of fetal and neonatal sleep and circadian rhythms. Sleep Medicine Reviews. 2003; 7 (4): 321-334. Heraghty JL, Hilliard TN, Henderson AJ, Fleming PJ. The physiology of sleep in infants. Arch Dis Child. 2008;93(11):982-5. Boo! We hope all of you have a happy and safe Halloween! We'll be back with a new post on Friday. Swaddling can be an effective tool for helping newborns to rest because they have so little control over their sometimes flailing arms and legs. However, a possible adverse effect of swaddling that has gained attention recently (though it has been known for centuries) is the increased risk for the development of hip dysplasia related to swaddling with the baby's hips and legs extended. Today we’ll explain what hip dysplasia is and how it is related to swaddling, and share tips for hip-healthy swaddling. Hip dysplasia is simply looseness or instability of the hip joint, which in its severe form results in hip dislocation. About 1 in 20 infants are born with some hip instability, though most (about 90%) are mild and resolve over time with normal development. Tight swaddling of the legs, however, is one factor that can interfere with the hips developing normally. How are Hip Dysplasia and Swaddling Related? Young babies’ hip and knee joints naturally flex into the fetal position (curled with legs and arms pulled toward the body) from their time spent developing in the womb. After birth, normal development of these joints will allow their legs to straighten over time. However, when a baby’s legs are not free to bend and flex, there is an increased risk of abnormal development of the hips. This is where tight swaddling of the legs can impact hip health. A 2007 review showed that the incidence of hip dysplasia is highly associated with “traditional” swaddling techniques that force extension of the hip and knee. (van Sleuwen 2007) Studies show that cultures using cradleboards, which force the hips and knees into full extension, have higher incidences of hip dysplasia. Keep in mind that other parents and caregivers who swaddle their young infants may not have information about safe swaddling techniques. Please pass this on! For more information about healthy swaddling and hip dysplasia explore the resources below. Van Sleuwen BE, Engelberts AC, Boere-Boonekamp MM, Kuis W, Schulpen TWJ, L'Hoir MP. 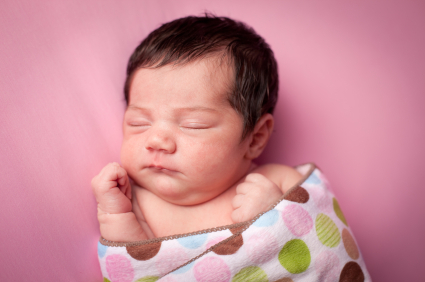 Swaddling: A Systematic Review. Pediatrics. 2007;120: e1097-e1106. Recently, a reader asked us a question about her 3-month-old daughter. She was worried about starting daycare because the baby didn’t like people other than her parents to hold her. Our reader also was worried that her baby would be afraid because she was too young to understand that her mother was coming back at the end of the day. In this post, we'll review some of the ideas we've shared in the past about sensitive babies, separation, and how babies learn what is safe and what is not. All of us have felt the pull of wanting to be with our babies when we are at work. We know how hard it is to leave babies with other caregivers however much we love and trust those caregivers. But, we also know that babies are born with a desire to learn and socialize with many people, not only their parents. Because your baby cries routinely when held by others, your baby may be quite sensitive to differences in how she is held and to overstimulation. 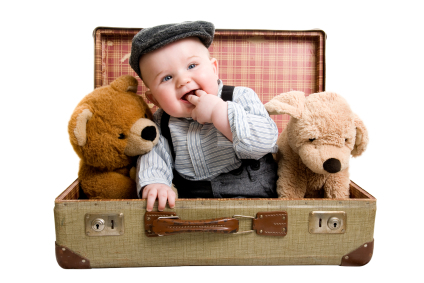 Because your baby is so young, it is unlikely that separation anxiety is happening yet. 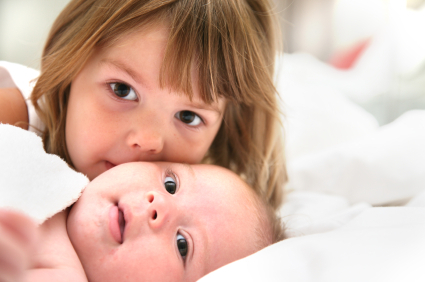 We’ve provided tips for helping babies deal with separation in an earlier post. As your baby gets older, she will have more tolerance for being with others, especially those who are familiar to her. Visiting the day care with the baby before the baby starts may be an option to help the baby be more familiar with the surroundings. While your baby might be fussy when you drop her off at daycare, she is likely to settle down quickly and be very excited when you return. Sometimes, she might also let you know that she was not happy that you left (but just for a short time). It will get easier once the routine is established. An important thing to consider is how you feel about your baby’s caregiver. It is important that you find someone that you trust so that you are confident that your baby will be happy with her new caregiver. 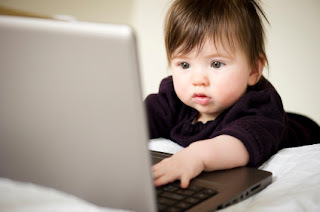 Remember our posts about “social referencing?” Your baby will look at your face to see if people are “safe” or not. 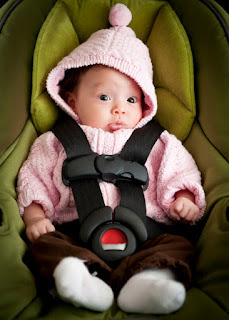 Having a happy, confident look when dropping your baby off, even if your baby becomes a little upset can be an important way to help your baby adjust to daycare and feel safe. Your understanding smile will let your baby know that while she is upset right now, you know she’s about to have a great day. A few days ago, this headline caught my attention: Oregon bus driver accused of berating mom, crying baby. Although the details are unclear and the investigation is still in process, news articles in papers across the country have covered the event that happened a few weeks ago in Portland, Oregon. Apparently, the bus driver pulled over after a baby had been crying for quite some time, despite the mother’s attempts to keep her baby calm. The driver walked back to speak with the mom; meanwhile other passengers urged the bus driver to keep going, saying that the baby was not bothering them. After the conversation with the driver, the mother took her baby off of the bus even though it was dark and she had not reached her destination. Although the exact sequence of events is still being determined, video footage shows that, over the next several minutes most of the passengers left the bus to stand with the mother and baby. For more information about the incident, you can refer one of the articles referenced below. If you’ve read our blog posts in the past, you know that babies cry as a way to communicate their needs. We don’t know why this baby was crying, but it’s likely that the baby could have been tired (it was nighttime) and/or overstimulated from the environment, among other things. When babies cry, it’s hard for all adults to hear, but it’s important to remember that there is a reason that crying sounds terrible - it makes adults act to meet the baby’s needs. Other passengers reported that the mother had been “cradling and cooing” the baby a long time; a perfect example of using repetition to soothe. What would you have done if you were this mother or another passenger on the bus with her? Have you ever been in a situation with a crying baby where you felt discriminated against? If you’d like to share a story with us, send us a comment. Picture this: a circle of women, babies worn in various types of slings or carriers on their mothers’ chests, all swaying to the beat of a Hawaiian tune. What am I describing? Baby-wearing hula! I was fortunate enough to travel to Hawaii to teach baby behavior to staff of the Special Supplemental Nutrition Program for Women, Infants and Children (WIC) in Hawaii. As my flight took off, I was flipping through the pages of the in-flight magazine and came across an article about baby-wearing hula, a weekly mother-baby class offered at a small hula studio, in the very town I was visiting. In a past post we talked about the benefits of baby-wearing, noting the benefits and risks of using baby slings and reporting on studies showing that wearing your baby improves infant attachment and reduces crying. Baby-wearing hula is a great example of combining exercise, bonding, soothing and baby-wearing. What I found most interesting about the description of the class was that the instructor was not focused on how many calories the mothers would burn, like so many other fitness classes, but on the babies themselves. The class allowed the babies to direct how much and how fast the class would go. Sounds to me like they are probably paying attention to some baby cues! Slow dancing with your baby is also a great example of repetition to soothe . There are other mother-baby (or daddy-baby!) classes that may be offered in your area that would have similar effects. Mother-baby yoga classes are quite popular and beneficial to both parent and baby. There are even some exercise videos out there that are made especially for baby-wearing parents. When my daughter was a baby I used to do a really fun baby-wearing video with Latin dance moves. My daughter loved the music and moving with the rhythm. Multitasking moms will also appreciate that you can combine bonding time with healthy movement. We encourage you to watch your baby’s cues to see when he or she is getting tired or over stimulated in the new environment. Taking a short break may help. You can always return to the activity once your baby is ready to engage again. Experiment with the direction your baby faces and see what he likes best. If he gets tired, you may want to face him in toward your body to minimize his stimulation. Read steps to help prevent overstimulation here. If he shows engagement cues, wanting to interact and play, face him outward to engage with other babies in the room. For more information about how babies use cues to communicate their needs, click here. How do you incorporate movement into your life with your baby in tow? We would love to hear your ideas. In a previous post, we asked our readers to share stories about when and how their babies learned to crawl. Several readers responded and the comments provided an excellent example of the most important information about crawling – all babies are different and there isn’t a set age or way that all babies learn to crawl. When someone describes a baby who is crawling, most people imagine a baby on her hands and knees, but some babies never crawl this way. 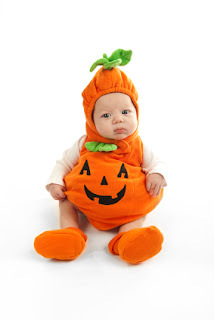 In fact, some babies never crawl at all and are content to roll or scoot around until they learn to walk. Our readers’ children learned to crawl at all different ages, ranging from 6 to 12 months and each had their own way of moving that worked for them. For example, one of our readers explained that because they have hardwood floors in her house, her baby moved backwards first and even after she learned to crawl on her hands and knees, it was easier for her to army crawl. Today, we’ll describe the different types of movements that can be considered crawling. As you are reading, keep in mind that babies don’t necessarily use each of these types of movement to get around and that the ages provided are just averages. If you have concerns about your baby’s physical development, contact your pediatrician. Pivoting is just what it sounds like – turning the body with the tummy on the ground. When pivoting, a baby will have her head up and her legs stretched out and she’ll use her arms and legs to pivot while curling her body. Some babies begin pivoting around 4 months of age and 50% and 90% master this ability by 6 and 8 months, respectively. Four-Point Kneeling is when a baby is able to support her weight on her hands and knees. While this is more of a stationary ability that needs to be mastered before learning to crawl on the hands and knees, babies in this position may rock back and forth and even fall forward if they rock with enough momentum. Fifty percent of babies can hold themselves up in this position by 7 months and 90% by 9 months. Although they may be unsteady at first, within about a month they become much more stable. In our house we call it the army crawl, moving forward by putting weight on one arm and the opposite leg and then switching to the other arm and leg, but not lifting the entire body up off the floor. Fifty percent are able to crawl this way at 7.5 months and 90% are able to by about 9 months. Reciprocal creeping is what most people consider crawling; the baby’s weight will be on hand and opposite knee and she’ll move by shifting weight from one hand and leg to the others. Fifty and 90% are able to crawl this way by 8.5 and 11 months, respectively. Just like our readers, our children all had their own ways to move. Jen G’s daughter, Lily, mastered crawling on her hands and knees at 8 months, and Olivia, Jen B’s oldest daughter, army-crawled until 12 months. Charlotte (Jen B’s youngest daughter) started crawling army-style at 5.5 months, was up on her hands and knees one week later, and has recently (at 10 months of age) began moving around on her hands and feet. No matter how your baby learns to get around, one thing is for sure, once they start moving, it’s hard to keep them still! Reference: Piper M, Darrah J. Motor Assessment of the Developing Infant. Philadelphia PA:W.B. Saunders Company 1994. In prior posts in this series, we've talked about your baby's senses - taste, hearing, sight, and smell. Last but certainly not least, we'll turn to a sense that has a powerful influence on your baby's behavior, touch. The sense of touch (the somaesthetic system) is the earliest to develop of all the sensory systems in the body. While the skin's sensitivity to touch, pressure, temperature, or pain is only part of the somaesthetic system, it is the part that most people think of when they hear the word "touch." From the first moments after birth, our instincts tell us to gently touch our babies, often starting with just a light stroke along their tiny arms or legs with our fingertips. We seem instinctively to understand that our touch plays a powerful role in our babies' lives. And so it does. The research into babies' somaesthetic system is filled with some older animal studies, dark circumstances in orphanages, and more recent and ongoing work. The findings are clear, a caregivers' touch is important for babies' growth and development. In the 1950s, a psychologist named Harry Harlow conducted a very dramatic (and likely unethical by today's standards) experiment with baby rhesus monkeys. He took the baby monkeys away from their mothers and put them into cages with 2 fake "mother monkeys" made of wire mesh, one bare and the other covered with terry cloth. The wire mother monkeys each had a bottle pushed through the wire so that the baby monkeys could feed. At the time, scientists thought that babies bonded with their mothers solely because mothers were a source of food. It was a surprise when all of the monkeys spent as little time near the bare wire monkey as possible and all their time clinging to the terry cloth covered mother monkey. Harlow revolutionized child care at the time, concluding that babies needed more than something to eat, they also need soft familiar touch. Tragically, human babies who have been removed from conditions of neglect (like in overcrowded and understaffed orphanages) struggle to function, socialize, and communicate. While the lack of touch is not the only reason for these children's problems, it is considered by developmental scientists and as a powerful contibutor. Touch has been shown to be a way that caregivers and babies communicate. When mothers use touch as part of games that they play with their babies (like tickling their tummys or gently touching their noses), they are rewarded with bigger smiles and more playtime.Most parents understand that a light tickling touch or a firm stroke on baby's back communicate different messages. Using touch, parents can help babies stay alert and encourage their babies to explore their world. A restraining touch can also be used as a warning and to prevent babies from hurting themselves. When babies cry, adults instinctively want to hold and touch them gently. We somehow know that while we can reassure our babies with our words, touch plays a special role in helping babies feel safe and loved. Repetitive touch (like rubbing a baby's back) is a common part of parents' efforts to calm babies and babies who are touched spend less time being fussy. An interesting side effect - when parents calmly stroke their babies' backs, they tend to become more calm themselves. The study of babies' sense of touch is relatively new. While the research into the need for touch goes back more than 50 years, today's researchers are learning the role that touch plays in the development of babies, physically, emotionally, and socially. Stay tuned and we'll talk more about touch in future posts. 1. Harlow HF. The nature of love. American Psychologist, 1958: 13: 673-685. 2. Provence S and Lipton RC. Infants in institutions. New York; International Universities Press, 1962. 3. Stack DM. Touch and physical contact during infancy: discovery the richness of the forgotten sense. In: Infant Development (2nd Ed), Wiley-Blackwell, 2010. As most of you know, the "Secrets of Baby Behavior" is written by the staff of the UC Davis Human Lactation Center. We started this blog over 2 years ago because our research had taught us that many parents were missing important information that scientists had learned about babies' behavior. We hoped that creating a commercial-free research-based blog (written by moms) would provide an objective resource for parents amidst all of the conflicting messages floating in cyberspace. We're so glad that so many thousands of readers have joined us along the way. Of course, we have continued our research and trainings. We've been working hard to support medical and public health professionals who want to share baby behavior messages with patients and clients. Recently, we realized that professionals could benefit from a blog targeted specifically for them. 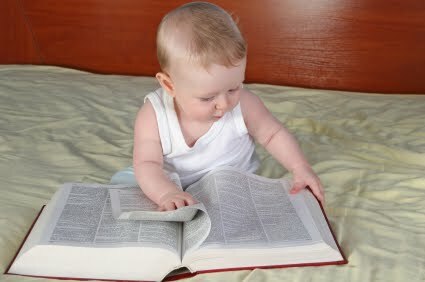 So, next Monday (October 10), we'll be launching a new blog called "Baby Behaviorist" at http://www.babybehaviorist.com/. We'll still be posting here on the Secrets blog and this blog will stay focused on parents' interests and questions. But, we know that some of our Secrets readers are professionals - doctors, nurses, dietitians, lactation consultants, and public health staff. We encourage those readers (and interested parents too) to check out "Baby Behaviorist" next week! Was there anything peculiar or funny about how your baby crawled? How long did it take before he or she realized she could get anywhere and everywhere? We can’t wait to read your comments and we’ll share our stories and some information about how babies learn to crawl! Off to a Training! Again? We're off to Orange County in beautiful Southern California for another training! We'll be back next week with a new post. With childhood obesity rates at epidemic levels in developed countries around the world, there is great interest in identifying successful interventions to decrease obesity risk. Recently, researchers have suggested a potential association between poor sleep and later obesity risk. Today we’ll discuss this potential association and present information from a new study examining the association between improved sleep in infancy and obesity risk at age 6 years. In a previous post we wrote about a research article linking short sleep duration to increased risk of obesity. (Bell 2010) In this study, the association found was not specific to infants because the authors grouped together kids of all different ages. Sleep and Obesity: Why the Link? Despite all of the research about the relationship between sleep and obesity, there is no evidence showing a cause and effect relationship. Researchers have theories for the associations they’ve found, including: (1) if children are sleeping less, their bedtimes may be later allotting them more time to take additional calories in the evening or (2) children may be less physically active because of fatigue from shorter sleep duration. Unfortunately, at this time, these explanations are just speculation and while some studies have shown associations between BMI and chronic short sleep in older children, none have focused on how sleep in infancy may or may not affect later risk for obesity. In a recent Australian study, providing education to parents of infants with parent-reported sleep “problems” at 7-8 months resulted in improved infant sleep organization but did not reduce obesity risk at age 6. (Wake et al. 2011) A Sleep “problem” was identified by asking 2 questions: (1) “Over the last 2 weeks, has your baby’s sleep generally been a problem for you? (yes/no)” and (2) if yes, the parent rated the severity of the problem on a 7-point scale with 1-2 mild and 5-7 severe. Nurses were trained to provide a short sleep education to parents at the 8-month well-child check-up. Topics discussed included normal infant sleep patterns and sleep problems and potential causes. Nurses helped parents to identify possible solutions and created an individualized sleep management plan for each family. Mothers were asked to complete a 2-week sleep diary and to choose one of two sleep strategies: “controlled crying” or “camping out.” Mothers also attended 1-2 follow up sessions with the nurse where sleep patterns and improvements were identified and new goals were set. The controlled crying strategy involved parents responding to their infants’ cries at increasing time intervals to allow the infant to learn to self-soothe. (see note below) Parents choosing the “camping out” strategy were instructed to initially stay with the infant while he or she fell asleep, slowly moving farther away over the following days, until the infant could fall asleep without the parent nearby. Parents in the intervention group reported fewer infant sleep “problems” at 10 months (56% vs. 68%) and 12 months (39% vs. 55%) compared to control groups. Intervention parents also reported fewer and shorter night-wakings than control parents. However, sleep duration was similar in both groups. Although the sleep intervention did decrease parent-reported “sleep problems” and night wakings, there was no effect of the intervention on obesity at age 6. Both intervention and control groups’ BMI and waist circumference were similar. After the study was completed, the researchers looked back at the data to see if there was any association between childhood sleep duration and BMI. 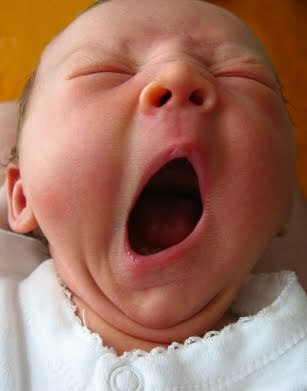 They found no association between sleep duration at 7, 10, 12 months or 6 years with obesity at age 6. According to recent data, your baby’s sleep patterns at night will likely not affect his risk of obesity in later childhood. We know (from experience) that some of you may be very tired right now and hoping for a solution to help your baby sleep better. Our best advice: know what to expect from your baby’s sleep patterns by reading our posts about how sleep patterns change with age and learn some ways to get yourself a little more rest. Remember, you can’t change the rate at which your baby’s body matures and learns to sleep for longer stretches, but you can change how you react to it! Arm yourself with the knowledge and know that this too shall pass. Note: We are not advocating letting your baby cry! We are simply reporting the methods used by the authors of the referenced study. Also, it is important to note that this intervention was carried out with older infants, ages 8-10 months; most infants this age have the ability to sleep a 6-8 hour stretch at night, but they may wake if they need something or to practice their new found motor skills. 1. Bell J, Zimmerman F. Shortened Nighttime Sleep Duration in Early Life and Subsequent Childhood Obesity. Arch Pediatr Adolesc Med 2010; 164: 84-845. 2. Wake M, Price A, Clifford S, Ukoumunne OC, Hiscock H. Does an Intervention that improves infant sleep also improve overweight at age 6? Follow-up of a randomized trial. Arch Dis Child. 2011;96:526-532. 3. Burnham MM, Goodlin-Jones BL, Gaylor EE, Anders TF. Nighttime sleep-wake patterns and self-soothing from birth to one year of age: a longitudinal intervention study. J Child Psychol Psychiatry. 2002;43(6):713-25. A Quarter of a Million Page Views! This week, Secrets of Baby Behavior will pass another milestone - a quarter of a million page views! At just over 2 1/2 years old, interest in our blog has continued to grow. Thanks to all of you who have been with us since the beginning and a big welcome to all of our new readers.We encourage all of our new readers to review the basics and then use the key words on the left to find the topics that are of most interest to you. Some of our earliest readers must have preschoolers now! We appreciate all you've done to spread the word about us...hmmm, I wonder what we'll do when we hit a milllion! After reviewing the literature, we also could not find studies showing that white noise is harmful for human infants. The one study we did see was very small and tested the effects of continuous (24 hours per day from day 7 of life) white noise on rat pups (baby rats). Continuous exposure to white noise (70 decibels) was found to cause delayed development of the auditory cortex, an important structure in processing speech sounds. However, it’s important to note that the results of this study cannot be inferred to human infants exposed to white noise during a particular time of day. Why? Not only do human infants develop differently than rat pups, but this study only looked at non-stop exposure to white noise, not short term exposure during naptime or nighttime sleep. 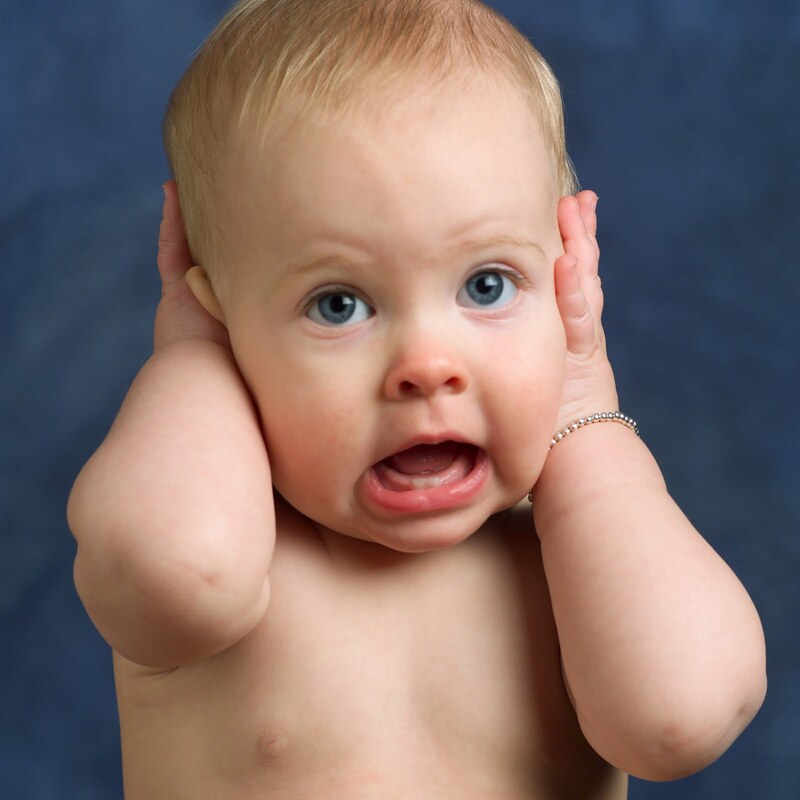 Common sense tells us that babies need to hear more than white noise. Some low-level white noise is safe for babies as long as it is not continuous and they are exposed to lots of different sounds throughout the day, especially human voices. 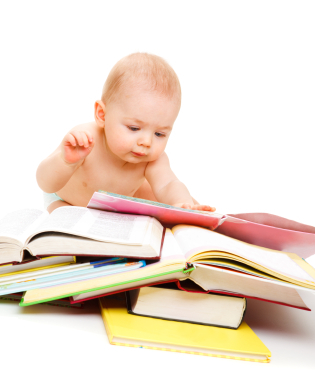 Talking and reading to your baby every day is a great way to ensure proper development of your baby’s hearing. What about White Noise Machines? Most of the white noise machines I came across online operated at a safe level of about 60 dB. However, we recommend checking the decibel level before buying one to be sure that it is indeed at a safe level. If you can’t find this information online, call the product manufacturer. In a past post about helping parents of infants get a little more sleep, we shared results of a study suggesting that white noise can be beneficial for parents as well. 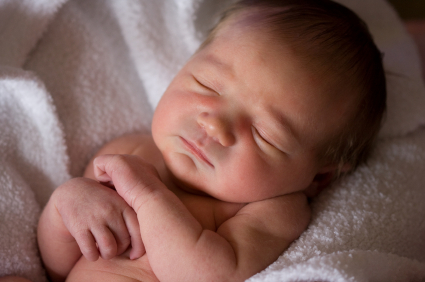 Healthy sleeping newborns can be pretty noisy because they move and make noises while they sleep. Since it’s best for babies to sleep in the same room as their parents, playing some low-level white noise can help you sleep through the wiggles and soft squeals your baby makes. By keeping the white noise low-level, you will still be able to hear your baby if she needs your help. Please let us know if you have any other questions or comments about past blog topics. We love to hear from you! Chang EF, Merzenich MM. Environmental Noise Retards Auditory Cortical Development. Science. 2003; 300: 498. Today, we’ll continue our series on infants' senses by sharing information about the sense of sight. First, we’ll look at some of the milestones related to visual development in the first 6 months of life and then we’ll answer 2 common questions parents have about their babies’ sight. A baby’s vision begins to develop at birth and is dependent on normal function of both the neurological system and structures of the eye. Newborns can see black, white, and shades of gray and can focus well to about 8-12 inches; they can see longer distances, but they can’t control the muscles in their eyes that allow them to see distant objects clearly. Because they can only focus a short distance, much of their vision is blurred. However, practice makes perfect; babies improve their focus by first focusing on faces and then moving on to bright objects nearby. At first, newborns can focus for only a few seconds at a time, but by 8 weeks, babies can focus their eyes on their parents’ faces for longer periods. The ability to focus is not the only thing needed for babies to see clearly. They must also develop "visual acuity," or the ability to see details. While most structures of the eyes are completely developed at birth, the visual parts of the brain are not fully developed. Studies show that during the first month of life babies’ visual acuity is about 20/120 (The Smith-Kettlewell Eye Research Institute). What exactly does that mean? If given an eye exam (and they could read), they would be able to read the big “E” at the top of the eye exam chart only. This is about 6 times worse than a normal adult seeing 20/20. By 2-3 months, babies are able to follow people or objects with their eyes, and by 4-months, babies begin to learn hand-eye coordination as they begin to reach for objects. Their ability to see details (visual acuity) improves as well; by 4 months, babies’ vision has improved to 20/60. Then, as babies learn to roll over, sit up, and pull up, eye-body coordination begins. Eye-body coordination is simply learning to control body movements within the world around them. 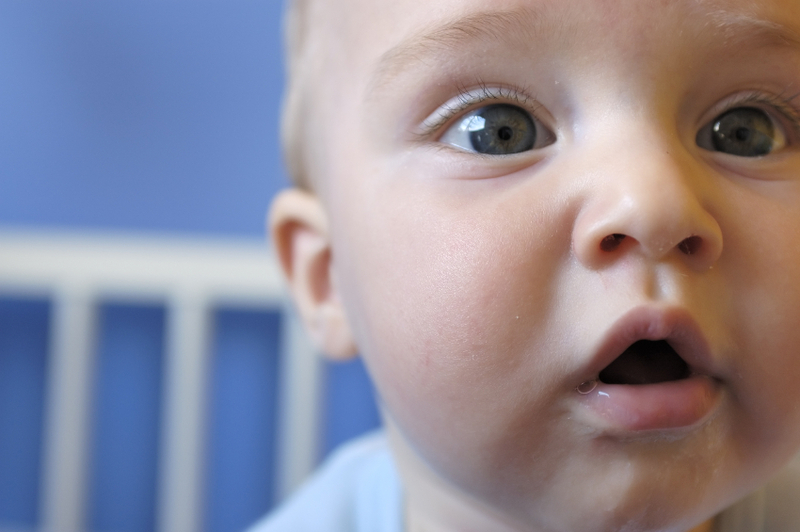 Babies’ peripheral vision becomes almost as good as that of adults by about 4-months old. One study using flashing lights as part of a test of peripheral vision in infants found that newborns oriented towards the flashing lights out to 30 degrees in their field of vision. As babies got older, peripheral vision improved until infants at 4-months old could see almost as far as adults do. “Two-eyed” or “binocular” vision begins by 4-5 months so that babies fuse what they see from both their right and left eyes into one image, allowing them to develop strong depth perception. 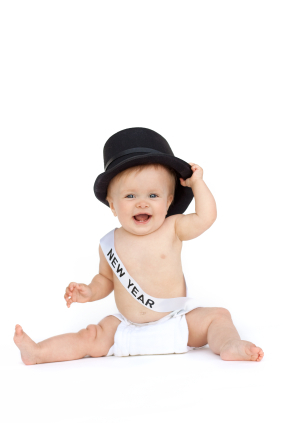 By 4-5 months, babies also begin to see in full color! Imagine how exciting their world becomes. All of these visual skills continue to improve over time, and by 6-months, many babies have developed 20/20 vision as they are able to see images more sharply and in greater detail. Should I worry if my newborn is cross-eyed? No! Young babies must learn to use their eyes together. They begin to practice this skill by following objects with their eyes as they learn how to track and use their eyes together. This takes neuromuscular control that babies must learn over time. By about 4-5 months most babies have learned to coordinate their eyes together and the crossed eyes should stop. You shouldn’t worry about a young babies being cross-eyed unless his eyes cross after 5 months of age; then you should contact an ophthalmologist. How important is it for my baby to have black and white toys? Many toy stores sell black and white toys, claiming that these encourage visual development of infants. While it’s true that infants prefer to look at high contrast (like black and white) images because they are the most visible to them, high contrast patterns are not the only ones babies can see. Babies can actually tell the difference between much subtler shades of gray and their sensitivity to contrast becomes 10 times better than at birth by only 9-weeks, meaning it’s almost as good as that of adults. It’s important to give babies the opportunity to see other colors (besides black and white) and their subtleties and to let them explore important objects such as your face, your hand or their own hands and feet. Lewis TL, Maurer D. Multiple sensitive periods in human visual development: evidence from visually deprived children. Dev Psychobiol. 2005; 46: 163–183.